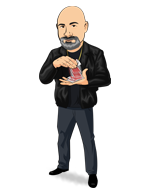 Today, when you order "Sal Piacente: Street Monte - Three Card Monte", you'll instantly be emailed a Penguin Magic gift certificate. You can spend it on anything you like at Penguin, just like cash. Just complete your order as normal, and within seconds you'll get an email with your gift certificate. 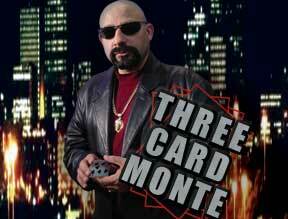 Sal Piacente: Street Monte - Three Card Monte (DVD) Casinos hire Sal to run their security -- he's THAT good. Learn this popular trick from THE BEST IN THE BUSINESS. NOW SHIPPING. HIGHLY RECOMMENDED. Order in the next 9 hours 26 minutes and it will ship TODAY! LISTEN UP, SUCKER! This is one of the oldest cons in American history. Sal Piacente (the Hitman of Magic) stars in this in-your-face DVD on the THREE CARD MONTE. You'll learn the game, the moves, and the psychology behind one of Magic's favorite close-up routines and one of the most dangerous games on the street... Knowledge is Power! PLUS, take an in-depth look at the anatomy of the game. If you are looking for a very good start to learning the three card monte, this is a good place to begin. Sal teaches this in detail and at the end, you know exactly how to play (and win!) the game. However, if you already know the basic mechanics of the game and want to know MORE about it, you would be better suited towards Daryl's guide to the 3 card monte (also available here at penguin). Overall, good place to start but ONLY if you are JUST starting. If you want to learn to perform a three card monte routine then this is best place to start. Sal takes you through the ins and outs of the game as well as presenting you with a good, usable routine to get you started. This is a classic routine that audiences know and love. If people know you perform this they will request it. If you want to learn the three card monte from start to finish this is the best DVD I own on the subject. The basic routine is straight forward and will not take for ever to learn. the subtleties you learn from Sal in this DVD are the most valuable part of the DVD. You will not be disapointed in this DVD add to cart. listen to the advice of Sal before you even think about ripping off a spectator with this trick. I was already familiar with the techniques, but Sal lays them out very clearly. I only gave this DVD 4 stars because the video quality was hard to see. There is hardly any contrast in the picture and it appears too dark on screen (for my poor eyes, anyway). Look at the demo and you'll see what I mean. But, otherwise I'd say "whip out the cash!" Practice to get smooth. The secret throw and the Mexican Turnover will take time to be convincing, but well worth the effort. First, yes this is very good for teaching you how to play 3 card monte, but it also teaches you how the people on the streets do it and how in any situation you cannot win even if you know where the card is. Teaching is quite short and moves could be done in more detail. Practice is required especailly for the Mexican Turnover and Bent Corner Scam. The bonuses are quite good also, Alabama hustle is convincing for the spectator and quite easy. Paper clip monte is not 3 paper clips but three cards, one with a paper clip on. a special card is required for this. Disk monte is the same as normal 3 card monte except 3 plastic round disks are used. Everything is explained very well, and the trick, or the game itself is really good! There are no gimmiks, and you can do it anywere. Get it! Everyone loves the 3 card monte, its fun. Even the people who don't like magic tricks will LOVE to play the 3 card monte. Its not that hard to do, and you will look like a professional street hustler in about a week of practice (maybe less).